In the year 111 BCE, the emperor of China sent his emissaries westward to the land of the Wusun. The emperor had grown weary of marauding Central Asian nomads who routinely swept into his villages, stealing the grain, making off with the women and burning the houses. Wudi realized he needed better, faster horses to drive them out, so he sent his envoys far west to the Wusun. A people of the steppe, the Wusun reportedly possessed a horse of exceptional beauty, speed and endurance. Indeed, this horse was said to have descended from the heavens. When it galloped, it sweat blood. Wudi sent an entire army in 103 BCE to what is now eastern Uzbekistan to find and capture some of the horses. His imperial forces suffered terrible losses and deprivation, but they succeeded in finding nearly two dozen superior horses, which they transported back to the imperial stables. There the Chinese court called them tianma, “heavenly horse.” The breed became the favorite mount of Chinese emperors and nobles. I was reminded of this imperial obsession last week by news out of Xi’an, one of China’s ancient capitals. While excavating the massive mausoleum of Emperor Wudi, Chinese archaeologists found skeletal remains of 80 horses that had been sacrificed and buried in two cavernlike pits…. Read the rest at Last Word on Nothing.com . hey mrs pringle I’m a big fan of your books! pkease make posts more often cuz we love them! Thanks for your kind words! I’m just finishing up a series of articles and will be posting again here in August. Please check back in then! Can you tell me the source/name, anything on the painting of the rider and two horses? I have a friend w/ a copy of it who would appreciate any info. 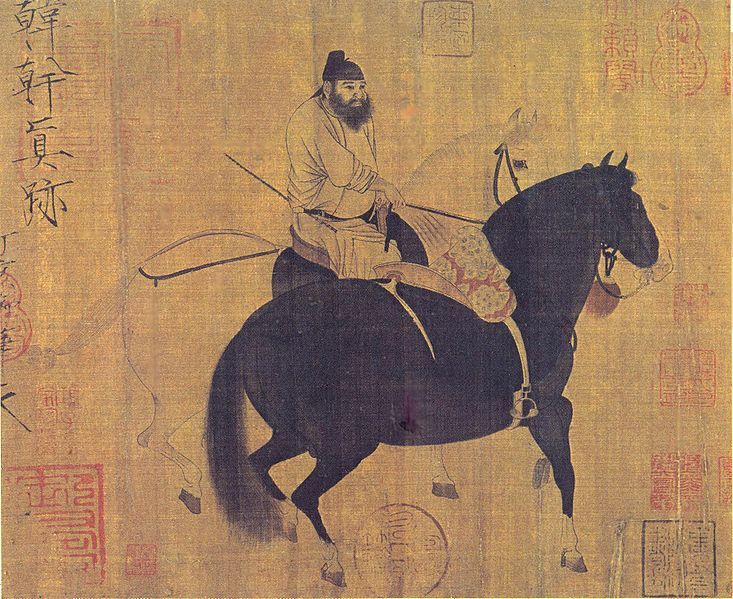 According to Wikimedia Commons, this is an 8th century, Tang Dynasty painting of two prized horses. The original painting now hangs in the National Palace Museum, Taipei, Taiwan. Hope this helps!